From nearby star clusters to distant galaxies, the autumn sky has it all. Late October evenings are theperfect time to explore thewonders of the deep sky. With naked eye, binoculars or a smalltelescope, thereis a veritable Halloween candy bucketful of sky objects worth lookingat, andthe evenings are still mild enough to make the journey enjoyable. Halloween, in particular, is anideal opportunity for abit of "sidewalkastronomy," weather permitting. If you have a telescope, thisis aprime opportunity to set it up for trick-or-treaters and offer a cosmicaddition to their traditional sugary fare. This seasonalnight skymap points out severalpossible targets for late October stargazers. The moon, Jupiter and some of theobjects in this autumnskywatching guide are excellent targets. The Owl Cluster in Cassiopeiais particularlytantalizing. The most important tip forobserving deep sky objects isto get away from the light-polluted skies of the city and find asuburban orrural location where these faint distant objects will shine through. Your local astronomy club hasprobably scouted out thebest locations in your area, and most clubs hold regular gatheringscalled "starparties" at these dark locations. There, you will get the best views ofthese fascinating objects and be able to view them with a varietyof telescopes. When you face east on an autumnevening, you will see awide array of stars above the bright star Capella in the constellationAuriga.The most recognizable landmark is the bright "W" of Cassiopeia,visible in all but the most light-polluted skies. To the W's right arethedouble chains of stars that mark Andromeda. Below it, in the directionofCapella, is the constellation Perseus. Let's use Cassiopeia as ourstarting point. Located in theplane of the Milky Way Galaxy, Cassiopeia is rich in open-starclusters. Theseare easy targets for binoculars or small telescopes. Close by, the bright star Ruchbahis a compact but richstar cluster catalogued by Charles Messier as number 103. On theopposite sideof Ruchbah is the Owl Cluster, named for its fancied resemblance to anowl. Many observers think it looks morelike the moviecharacter "E.T." than an owl. If you use the upper three stars ofthe Cassiopeia W as anarrowhead, they point to the AndromedaGalaxy. Although visible to a trained eyewithout any optical aid,this galaxy is more easily seen by beginners with binoculars. It lookslike avery faint wisp of smoke against the dark sky. In a telescope, itcontinues toresemble a faint cloud of smoke, but is seen to be accompanied by twosmallergalaxies, Messier 32 and 110. These satellite galaxies arefarther away from the maingalaxy than you might think from photographs, since the main galaxy isusuallyoverexposed in photographs and much larger than it appears in the sky. In a medium-size telescope it lookslike a faint echo ofthe bright star. Almach is one of the prettiest double stars in the sky. Almost directly overhead in theremote northern reaches ofAndromeda is the so-called "Blue Snowball." This is a planetarynebula: a puff of gas set off by a dying star. Viewed through a telescope, itis very small and very bright, easily mistaken for a star, except foritsunusual blue color. Below Cassiopeia, in the directionof Capella, lies theconstellation Perseus. 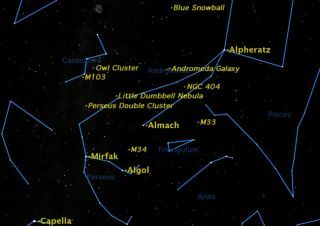 At the heart of this constellation,surrounding the starMirfak, is the Alpha Persei Star Cluster. Only 600 light-years away,this isone of the nearest star clusters. Between Mirfak and Cassiopeia liesthe Perseus DoubleCluster. Just visible to the naked eye, this is one of the mostglorious deepsky objects, whether viewed in binoculars or a small telescope. There are many other objects ofinterest in Perseus, suchas the eclipsing binary star Algol, the rich star cluster Messier 34,and the "LittleDumbbell" planetary nebula, Messier 76. If you are blessed with truly darkskies, have a look forMessier 33 in Triangulum, just underneath Andromeda. Although this is one of the nearestand brightestgalaxies, it is extremely difficult to see because of its large size,poorlydefined edges, and low surface brightness. It takes a dark sky and amoderatelylarge telescope to spot its faint glow.